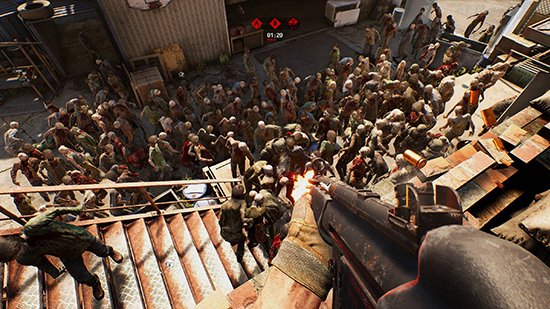 The release of the Windows PC closed beta of Overkill's The Walking Dead, the new co-op multiplayer shooter from developer Overkill – A Starbreeze Studio. The game’s first two missions will be available together with two camp defense scenarios, with additional stages rolling out in the lead up to its official global launch on PC on Nov. 6. Closed beta servers will go live in multiple intervals throughout the month. For the full schedule of closed beta dates, visit https://www.overkillsthewalkingdead.com/2018/10/08/closed-pc-beta-details/. Starbreeze is also hosting a special Overkill’s The Walking Dead closed beta livestream today at https://www.twitch.tv/starbreeze beginning at 18:00 CEST 12pm ET 9am PT. Overkill’s The Walking Dead will arrive on the PlayStation 4 and Xbox One on Feb. 6, 2019, in the Americas and Feb. 8, 2019, in Europe and other territories. Console pre-orders are available now digitally and at most major retailers.